Inside the church, the original decoration has been preserved. The roof of the nave is in the shape of a clover leaf and is stencilled with flowers. 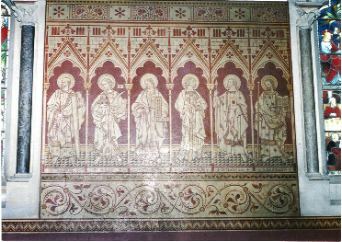 The west wall is decorated with the wall paintings which are All Saints' finest feature. To the left of the war memorial is a Noah's Ark scene and to the right is a scene depicting the Exodus, with the Israelites watching Moses summon the Red Sea waves to drown the pursuing Egyptians. Flanking the west window are four figures representing Bishop Remigius, founder of Lincoln Cathedral; St Guthlac of Croyland; St Mary Magdalen; and Little St Hugh of Lincoln (not to be confused with St Hugh, Bishop of Lincoln). The window itself depicts figures from the Old Testament - Abraham, Sarah, Isaac, Hannah and Samuel. Below and to the right is the current font, in Caen stone from Normandy. By the door to the south porch is the mediaeval parish font dating from the 14th century, an octagonal bowl. 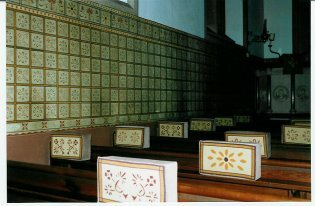 The north wall displays more wall paintings, the patterns of which are reproduced in the embroidered kneelers standing in each pew. The stained glass is early 20th century. At the west end the window commemorates Edward Howard, who died in 1922. 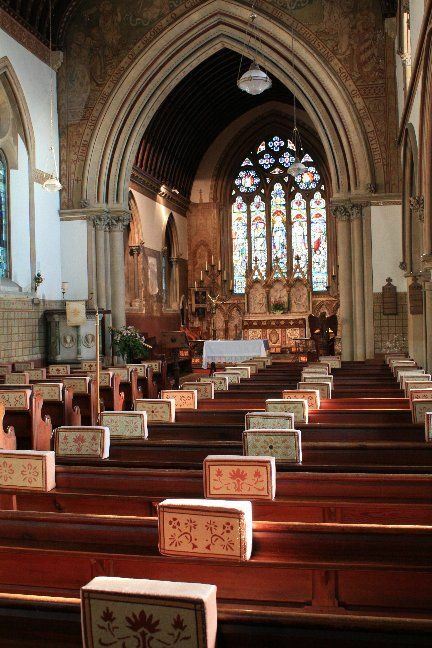 He was churchwarden, an office held until recently by his great grandson Christopher. It shows Bishop St Hugh of Lincoln holding a model of Lincoln Cathedral, and St Theodore, an early archbishop of Canterbury, holding a model of Canterbury Cathedral. Below them are scenes of All Saints' predecessor, St Peter's, and the old Nocton Hall (destroyed by fire in 1834). The middle window on the north side is in memory of Leslie Wray, a village lad killed in action at Cambrai in 1917. The top of the window contains the badge of the Tank Corps, in which Leslie served. Below this are figures of St Oswald and St Etheldreda, and below them are an early tank and a machine gun (Leslie Wray also served in the Machine Gun Corps). The window next to the pulpit shows the Mayflower sailing to America and notes the descent of Evangeline Dennis from one of the Pilgrim Fathers. The saints in this window are St Aidan and the Venerable Bede. 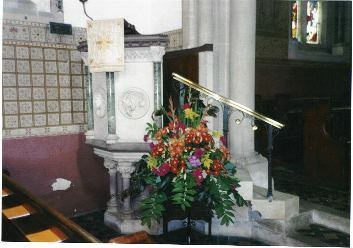 The pulpit is typical of the no-expense-spared approach taken by Lady Sarah and is in Caen and Ancaster stone, with depictions of St Peter, St John and Christ Himself. The south aisle commemorates, in the eastern window, Mary Wilson, daughter of Edward Wilson, a vicar of Nocton (1846-76), showing the Virgin and St Mary Magdalen, with the arms of the Marquess of Ripon, including the stags of the Robinsons, the galley of the Campbells (relatives of the Robinsons) and the six pointed star of the Hobarts. 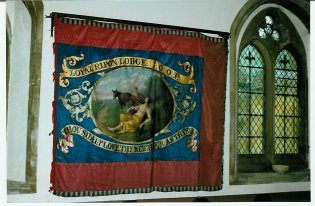 In the centre of the aisle hangs the banner, depicting the Good Samaritan, of the "Loyal Ripon Lodge" of the Independent Order of Odd-Fellows, a Victorian friendly society. The chancel arch is surmounted by a massive painting of Christ in Glory. Along the north wall are apostles and evangelists alternating with stained glass windows. The right hand window shows New Testament themes; the left, themes from the Old Testament. 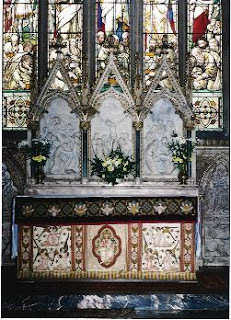 The east window, designed by Dean Henry Hobart's daughter, is flanked by paintings of the Resurrection on the left and the Ascension on the right. The window itself depicts all the saints gathered around the archangel Michael, with elders casting down their crowns before the Throne of God. The reredos below the east window is the focus of the church. It is a triptych of marble panels representing the road to Calvary, the Crucifixion and the Entombment of Christ. The altar itself is intricately carved, although the carving was damaged in a fire. The carving is normally hidden from view by the altar frontal and is revealed only when the altar is stripped on Maundy Thursday. Also within the sanctuary are the mighty twelve foot high branched candlesticks, decorated with angels. 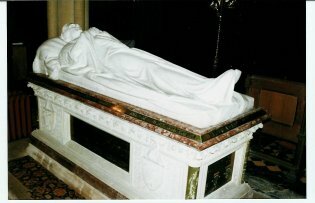 To the south of the sanctuary is the tomb chapel, the focus of which is of course the tomb of the Earl of Ripon, Frederick Robinson, in whose memory the church was built, and his wife Lady Sarah. This is described in more detail in the section on "Monuments". The wall paintings continue through the chapel, showing St Peter and St Paul, Christ's entry into Jerusalem, and Christ instructing his disciples to "suffer little children to come unto me."